- Candidate should possess good communication skills. - This is a Non Technical role and does not involve any "Coding, Programming or Development". - Role involves extensive travel both within and out of Bangalore. - Role will involve conducting Software License Reviews. # Candidates should be currently based in Bangalore and willing to attend face to face interviews. # A detailed description around the role and compensation will be discussed with the shortlisted candidates. #EMC_Placement_Papers :- Latest patterns shared by candidate! There are 6 rounds totally. Just be prepared on one topic perfectly for one minute. They'll give you 2 or 3minutes to think and then talk on it. (topic of your choice). 2. Technical aptitude and essay writing. 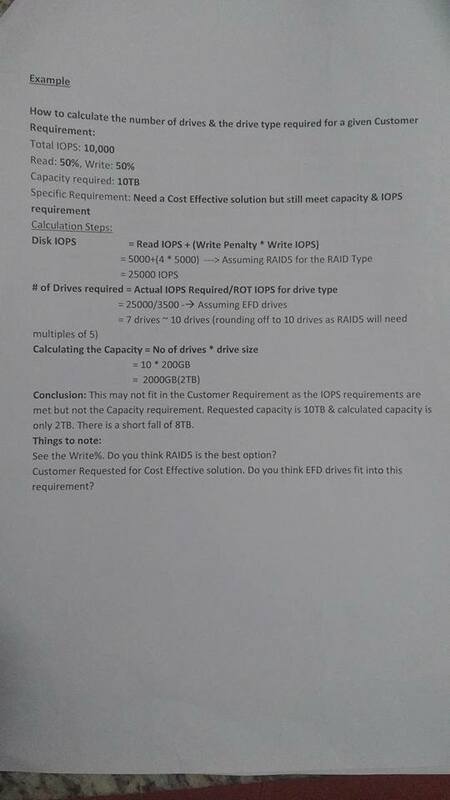 They'll give you a sheet of technical questions , objectives basically with consists of SAN , OS, DBMS,CN and 2 or 3 questions related to EMC products.Questions are quite easy, all you need to do is go through the basics. 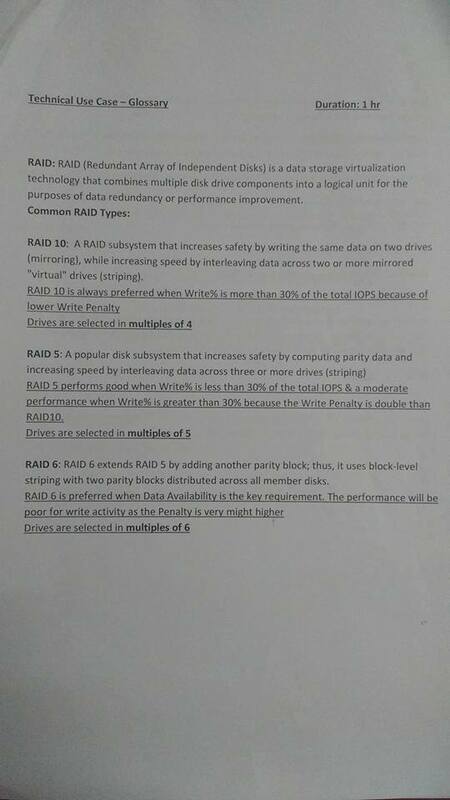 They'll give you a document which has basic defination and functionality of five different raids and a problem solved based on it. They will give you a typical scenario where the customer needs , certain requirements and you need to solve the problem and find out which raid you can suggest them. 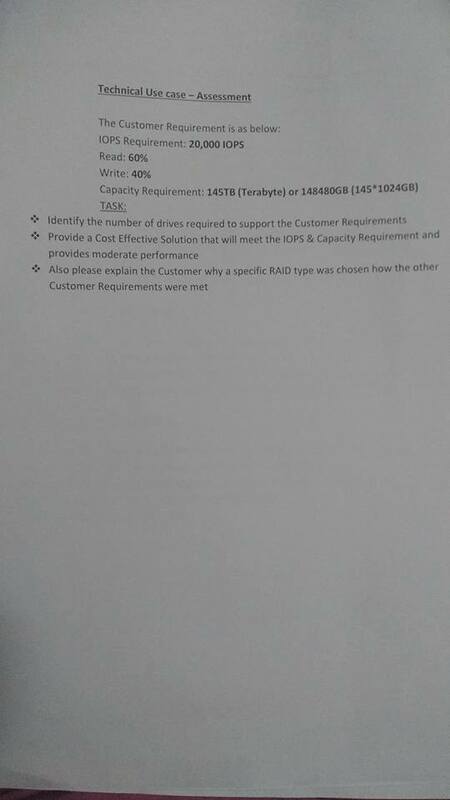 Questions on the previous round, why did you choose to assign that particular raid to the customer, questions on your resume(They asked me why is you're percentage so and so,questions on my certifications etc) . Tell me about yourself, explain your project,questions on hobbies, what's your favorite subject and why, why you wanna join EMC . Are you ready for night shifts? And finally he asked me , do you have any questions? #Note :- @ALL Fresher's whoever certified in CCAN ? SAP Certified / Infra Technologies Trained course must and must try here ! 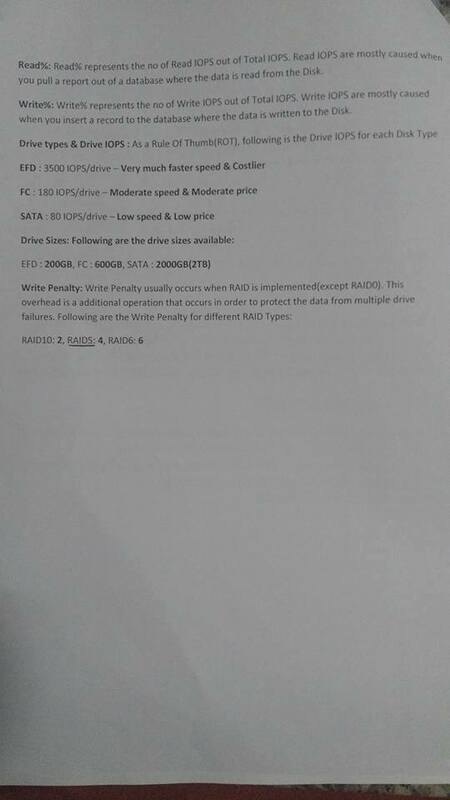 Drive SPOC – Amrita Singh. Interview with Amazon scheduled on 8th Oct -16 2016 at 10:00 AM (IST). Under general supervision, performs variety of tasks in testing case execution from start to end at the user level, both manually and with automated tools. The associate interacts / coordinates with Developers /BDMs, identifies and corrects errors / complaints, maintains records of work received and work performed etc. The Associate would be responsible for understanding the product in detail, and updating the test case tool with test execution results. e. Work in rotational shifts and be flexible for overtime. Knowledge/ Experience in testing and analyzing any consumer facing device/website and will be a plus. Skills : Invoice process, Excellent verbal and written communication. Salary : 15k to 19k as CTC per month. (0.3 to 1 year 16K, 1+year 19K). Prime Focus Technologies (PFT) is seeking applications from candidates with proficiency in both English and any one of the regional languages (Kannada/Hindi/Tamil/Telugu/ Bengali). The job involves creating subtitles for movie and TV serials from regional languages to English. Subtitles are captions displayed at the bottom of a cinema or television screen that translate or transcribe the dialogue or narrative. #Note :- Mechanical Fresher's can think to try ! interview on 8th Oct 2016 between 10 am to 5 pm. Shahi Exports is hiring for "Executive - PBC Mechanic" and below are the details. Interested Candidate can share your updated resume or walkin to below address for interview on 6th Oct ,7th Oct,8th Oct 2016 between 10 am to 5 pm. Land Mark: Opposite Total Mall, Sarjapur Road. 5. Oracle Financial Services : KPO Profile! Full Time B.com / BMS / BBI / BAF / BFM. Appeared / Completed CA / CPT / ICWA /CS -NOT REQUIRED. Relevant work experience: 0yr to 2 yrs. Whitefield Road, Bangalore, Karnataka, India-560 066. 9. NUCOT : hr Resource Executive / Manager / Corporate Recruiter / Internal recruiter. Involving in End to end recruitment. The candidate should be active and should good communication skill. Great energetic personality,looking for lady candidate. Looking for Any Bachelor degree (non technical background). Ability to handle complex legal documents and apply general legal concepts in day-to-day interpretation. Ability to handle pressure and stress with a balanced mind. Detail & quality oriented approach. We are NOT into DRAFTING/ NEGOTIATING of contracts. Walk-in interview for Contract Reviewer/Analyst on 8-Oct-2016 at 8:30 AM to 11:00 AM. 12. Ocwen :- Walk in Jr Project Engineer. Walkin Interview from 8th October to 31st October from 12 PM. Interested And Eligible Candidates Attend The Walk In Drive In Following Venue Location Between 04th to 08th october 2016 At 10 A.M To 3 P.M.
1) Please mention ‘DS-Priyanka US” on top of your cv before submit your candidature. up to 19,000/- take home incentives. 2. Non Voice- Should be good in drafting a mail & chat and should have good writing skills. There will be cab facilities, incentives and food coupons given. Up to 2.2 lakhs. Eligibility Criteria- both Fresher and Experienced are considered. Should be a graduate, if not a graduate he/she should at least complete PUC with 6 months of experience in BPO sector. BE and B Tech freshers with more than 60% are not considered. Loking forward to see you at the venue. Sarjapura outer ring road, Bangalore. 4. Excellent computer skills in a Microsoft Windows environment. 5. Effective oral and written communication skills. 3. Sourcing through multiple channels - Portals, References, Networking, Database, Google, LinkedIn etc. 4. Managing end to end Recruitment for Clients that includes sourcing, screening, interview scheduling & coordination, negotiating compensation packages etc. We are looking for candidates with good communication & having qualification as Diploma in Handloom Technology / Textile . Pls walk-in with your updated resume on working hours between 11.00 am to 4.00 pm on 8th Oct 2016. Walkin Inteview for Freshers: 2014 / 2015 / 2016 Batch . Bangalore. Are you looking for jobs in Hyderabad, Chennai, Pune, Noida, Gurgaon? passouts can also attend .MBA and B.tech graduates. Skills Needed: Candiates should have good communication skills, Able to work in shifts, Ready to Join the Industry. Interpret client specifications and translate into a flow chart which outlines the steps/jobs for project processing. Research, submit and check outside list conversions, internal house and list rental selections as well as other computer jobs required for processing. Analyze and validate results against project specification for consistency and accuracy. Adhere to project schedules and handles multiple projects concurrently. Research and resolve production related problems. Maintain a service level of 99.6% for accuracy and on-time completion of project. Interact with TCS departments and clients as needed to fulfill project requirements. Ensure rate card charges and project cleanup is submitted accurately and on time. Any Degree with 0-2 years of experience. Venue: RMZ Eco World, Plot C1, Campus 8A, 5th Floor, Outer Ring Road, Bengaluru, Karnataka-560103, India. Landmark: Road next to Intel Office (Service Road) Or Road Opposite to Ibis Hotel (Outer Ring Road). Complete analysis of candidates current / pervious project and responsibility undertaken per project. Good Communication skills: The role requires daily coordination with Team leads, Sales, Account managers and candidates sitting on site in US hence a strong hold on English is mandate. Opposite Audi Service centre / Near EC Police Station.